If a face-up DARK Machine monster(s) you control is destroyed by battle or card effect: You can Special Summon this card from your hand. Once per turn, during the Battle Phase (Quick Effect): You can toss a coin 3 times; destroy face-up monsters on the field, up to the number of Heads, then if the result is 3 heads, draw 1 card. This card cannot attack the turn this effect is activated. If this card is sent to the GY: You can add 1 Level 7 or lower monster that has a coin tossing effect, from your Deck to your hand. Nice to see after 16 years, Barrel Dragon gets a retrain, and a very good one at that in Desperado Barrel Dragon. 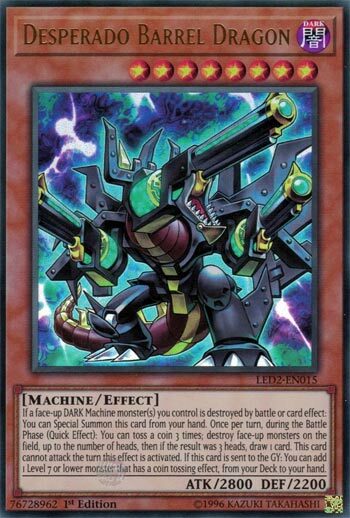 Desperado Barrel Dragon is a Level 8 DARK Machine with 2800 ATK and 2200 DEF. Stats are solid for a Level 8, being DARK and Machine gives some pretty great benefits as well. If a DARK Machine(s) you control is destroyed, you can summon this from the hand. Nice, easy way to summon this. One interaction I can see is Kozmo Dark Destroyer destroying itself to summon a Kozmo from the deck while this comes from the hand. Once per turn, during either player’s battle phase, you can toss a coin three times and destroy face-up monsters on the field equal to the number of Heads you hit. Better than the original Barrel Dragon, now you don’t have to get 2 Heads to destroy something, but 1 Head per card you want to destroy. If you are lucky and hit 3 Heads, you can draw 1 card. Nice bonus, but considering how hard it can be to land 3 Heads, I honestly think this could of let you draw 2 cards. The sad part is that this card cannot attack if you use the coin toss effect, so you should hope to hit some Heads. If this card is sent to the GY from anywhere, you can search for a Level 7 or lower monster that has a coin tossing effect from the deck to the hand. Nice little searcher for those coin toss cards, even though most of them are not that great. I like this card and I hope to see more coin tossing support in the future. Art: 3.75/5 Would of been higher if we got the OCG art, but guns are too scary. It’s a shiny new Dragon. Desperado Barrel Dragon, gets an Extra Level then his non Desperado counterpart, and 200 extra attack. Dark and Machine are good, and Level 8 is Trade In bait too. This card has a beautiful ability to be Special Summoned from your Hand when a Dark, Machine(s) of yours is(are) destroyed. As a Quick effect, one during the Battle Phase, you can toss a coin three times. Each heads result lets you destroy a face-up Monster on the Field, and three heads gets you a Draw. You do lose the ability for this card to attack that turn though, but no big thing, so long as you got at least one Monster destroyed I figure. Lastly, if this card goes to the Graveyard, from anywhere, as nowhere specific is stated, add a Level 7 or lower Monster that has a coin-flip effect from your Deck to your Hand. That’s nice enough, I suppose, even if overall those cards aren’t going to be anything good. But this guy IS good, and splashable.